The feather tree tradition originated in Germany at the turn of the century. They became popular as an alternative to cutting live fir trees to celebrate the Christmas holiday. Turkey or goose feathers were coiled around heavy gauge wire to create �branches� which were then secured to a wooden dowel �trunk�. 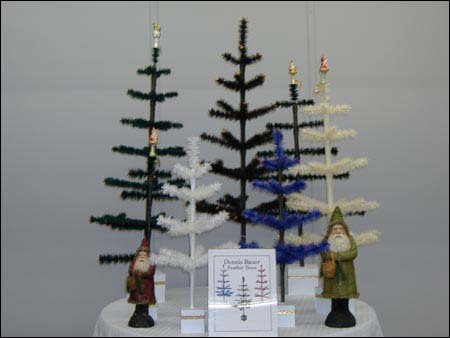 Feather trees were the first �artificial� Christmas Trees. Their limbs fold upward for easy storage. Apple Tree Gallery always has an excellent supply of smaller size ornaments which compliment these table top Victorian era trees. Any style tree, in any color, in any size and berry tips may be custom ordered. All bases come with a Gold Dresden band. Please e-mail or phone for additional information regarding sizes and colors which can be custom made to meet your needs.